Dubbed the ‘Grandfather of Singapore Sculpture’, Ng Eng Teng who was born on July 12, 1934, studied painting under first-generation masters such as Georgette Chen and Liu Kang. He then moved to England to further his studies in ceramics. Upon returning to Singapore in 1966, Eng Teng produced prolific works throughout his career until his death in November 2001. He was a celebrated artist in Singapore, remembered for his large-scale sculptures gracing many public spaces. Among Eng Teng’s slew of sculptures, one stands out; it is an homage to a great art legend, Frank Sullivan. Sullivan’s influential foothold in the art movement in Malaysia and Singapore inspired Eng Teng to create the ‘Bust of Frank Sullivan’ in the 1970’s. Eng Teng’s sculpture, ‘Bust of Frank Sullivan’ which was previously in the private collection of an English estate in London, shows his meticulous FRANK SULLIVAN brilliance, capturing the essence and minutiae of Sullivan’s features perfectly, from his smile to the waves in his hair. It could also be assumed that both Sullivan and Eng Teng had crossed paths during Sullivan’s active advocacy of the local art scene in Malaysia and Singapore that led him to pay a tribute to this great man. ABOUT FRANK SULLIVAN Frank Sullivan was one of Malaysia’s pioneer in the Malaysian art movement. His contribution to the Malaysian and Singapore landscape is very well published in numerous art books in both countries. Sullivan was the Australian Press Secretary to the first Prime Minister, Tunku Abdul Rahman. Sullivan had a close, lifelong association with Malaysia that began during the Pacific War. In 1946, he purchased his first painting in Singapore and became so engrossed with the art of Malaya that, in 1952, he co-founded the Malayan Arts Council (MAC). At the brink of independence, in 1956, the MAC successfully broached the idea of a National Art Gallery with Tunku Abdul Rahman. With Tunku’s support, the gallery was institutionalised in 1958, at his residence where it remained until moving to its current location in 1984. Sullivan was diligent in the materialisation and promotion of the gallery. His position in the gallery was initially as a secretary of the first Working Committee and then as a member of the Board of Trustees, a position he held until 1971. Further promoting modern Malaysian artists, Sullivan opened the Samat Gallery, Malaysia’s first commercial gallery for contemporary art, in 1967. It is without a doubt that he played a pivotal and integral role in the Malaysian art scene, discovering talents such as Khalil Ibrahim who held his first exhibition at Samat Gallery. 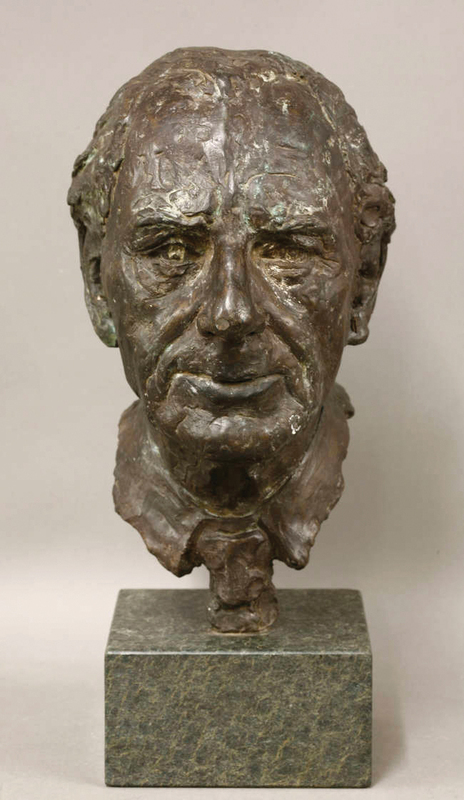 Frank Sullivan’s influential foothold in the art industry in Singapore and Malaysia probably inspired Eng Teng to create the ‘Bust of Frank Sullivan’.